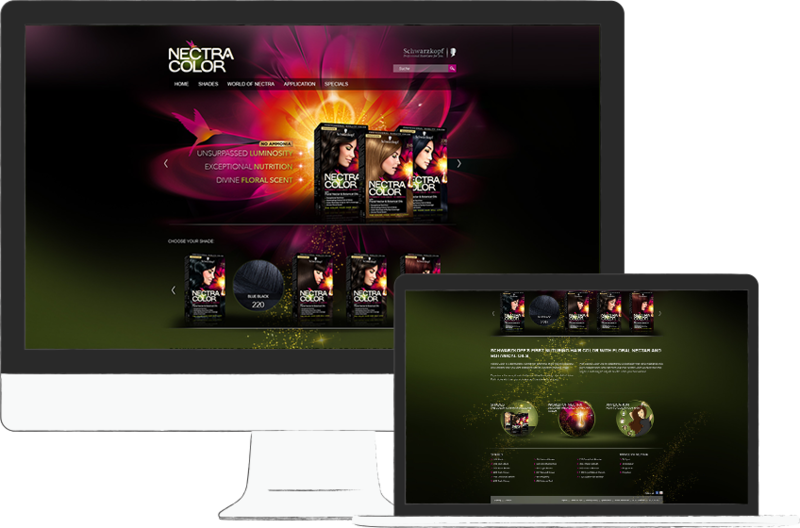 Nectra Color is a sub brand of Schwarzkopf and the first coloration of Henkel Beauty Care which renounces the use of Ammonia. Introduced in 2014, the product line came up with a pretty CQ5 based international brand website, stocked with information on each shade of the coloration line and many more interesting information on the brand and it’s colorations. 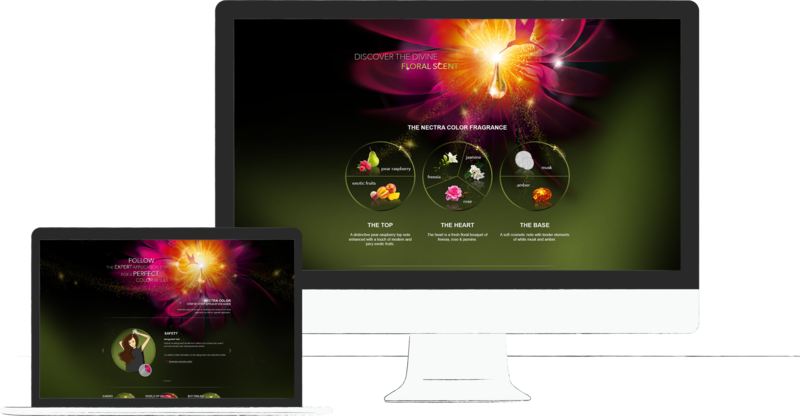 The website’s home page included an image slider, placed on the brand’s typical flower in the background, a product carousel with direct links to each color shade and a short description about Nectra Color. The heart of the website, of course, was the products section. Each available shade got a single page including all necessary information on the handling an the expectable color result. Next to a short overview about all existing color shades, the website was provided with some more very interesting information about the product, such as the technology and the official TV spot. To avoid mistakes in the coloration’s usage, the website included some helpful step by step tutorials, guiding the customer to a perfect color result. All steps came with a description and a hand drawn illustration of what to do. This website was my first project for this customer and I was really excited. On top of that, it was the first website I designed to be developed in CQ5, a content management system I didn’t ever hear from before. Therefore, it really was a big challenge as well as a very big chance for me. There had been a lot of specifications regarding CQ5, all other websites of Schwarzkopf brands and, of course, regarding the CI of the brand. 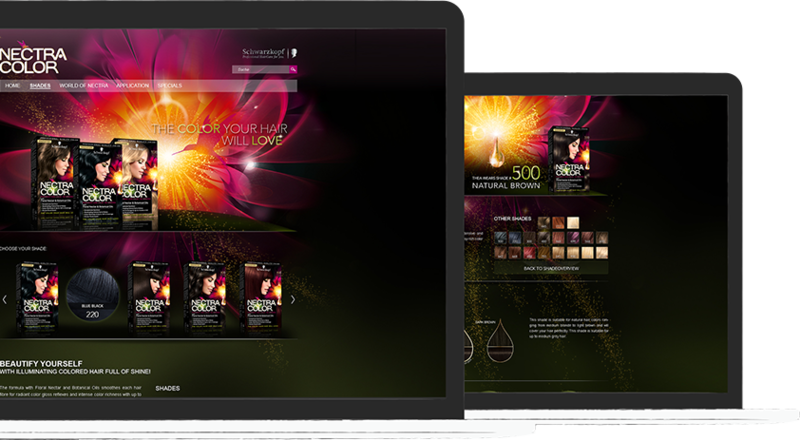 Our plan was to create a website which’s structure should have been similar to all other Schwarzkopf brand pages but which should have looked different – less compressed, less fixed, more modern. Therefore, we used the flower from the package design to create a stage for the slider, which had been typical for all Schwarzkopf brand pages. Furthermore, we tried to avoid using square spaces anywhere to break out of the typical look of all websites. A mission that succeeded.